Yahoo! Go for TV Media Center software is based on Meedio Pro which was initially selling for $45. Yahoo! bought the company and released the popular PVR software for free. The moment I installed Yahoo! Go for TV, I admit I was very impressed. Yahoo! 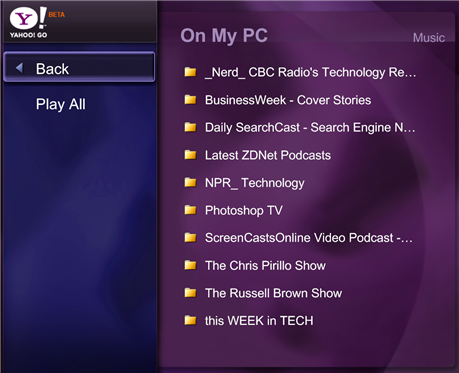 Go for TV has a better interface (see screenshot below) and offers many more features than Dell Media Experience Center and the Pinnacle PCTV Stereo which I currently use. Yahoo! Go can play DVDs, show Flickr photo galleries, run slideshows of pictures on your PC, play MP3 files or Music CDs and lets you watch videos locally stored on your hard drive. Plus, if you computer has a TV Tuner Card, Yahoo! Go for TV can convert your PC into a personal DVR - watch Live TV or record TV shows for later viewing. Best of all, Yahoo! for TV is compatible with TiVo - just connect to a different Video In port on your TV. Step 3: The Yahoo! Go for TV interface shows the Initializing plug-ins message but if you are located outsite the US, the following error pops up (screen capture attached) - "Error - Unauthorized IP. Please verify that you have an valid IP (US only)." Press OK. Step 4. Open your Firewall software and block YGTV.exe from accessing the internet. YGTV.exe (Meedio 0.1.34.0) is located inside C:\PROGRAM FILES\Yahoo!\YAHOO! GO FOR TV folder. Using this technique, you can use most of the Yahoo! 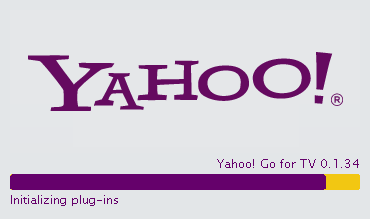 Go features excepts the ones that require an internet connection like Yahoo! Launchcast, Online Music Videos, Flickr Photostreams, Yahoo! Photos sharing, etc. Here's a screenshots of Yahoo! Go for TV inteface showing a listing of podcasts on my computer in India. Unfortunately, the Pinnacle PCTV series of TV Tuner cards are not support.You need either ATI, AverMedia UltraTV or NVidia Dual TVmce Tuner cards. If you plan to use Yahoo! for TV on a laptop, get the Hauppauge WinTV-PVR-USB2 that connects via USB.